I recently had the opportunity to take a few Biblical Hebrew classes from Israel Institute of Biblical Studies. 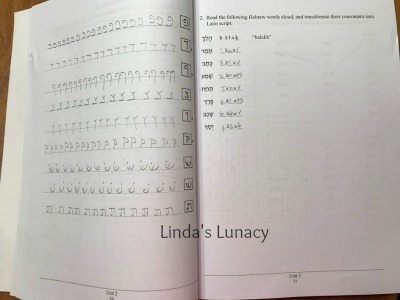 I have had an interest in learning Biblical Hebrew for a few years now. 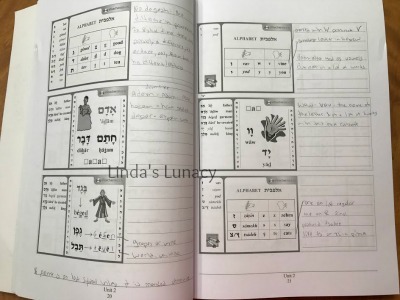 I had learned a few words in Hebrew on my own, but this was my first experience taking a class. All the classes are online. There are 30 classes in this course, done over 9 months. There are many different times that the classes are held, all Monday – Friday. You get to chose which class you would like to attend. Class size is small, so we get plenty of chances to answer questions and ask questions. The teacher calls on each student to answer questions. There is a white board that is used during class. The students are also able to write on the board during class using a pen tool on the screen that you direct with your computer mouse. We have used it to mark letters, to write letters, etc. I like that there is so much student participation. The instructors that I have had have been very encouraging when a student answers a question wrong. Encouraging them, putting the slide up where the student can see the answer to the question, and leading the student to find the answer. I was asked to write this review after taking two classes. It has now been 6 weeks since our class started. One week class was cancelled for Israel Independence Day. I missed a class one day for family reasons. One week the teacher emailed ahead of time to let us know we would be having a sub for class that week. The sub was just as knowledgeable as our regular teacher. He picked up right where she left off, so I think when we have class next week we will be able to move on seamlessly. I like that I had the option to receive text message reminders for class, as well as the email reminders that are sent automatically. I receive both. Each class is recorded and a couple of days after the live class I receive an email with a link to the recording. This was great for the class that I had to miss. I can view it later and not get behind. It’s also great for reviewing what was covered in class while doing the homework. Yes, there is homework! The amount of time spent doing it has varied. I like that passages of scriptures are used from the very 1st lesson. No, you can’t read it at first, but the instructor reads it aloud while you follow along. The instructor also had us find the letters we were learning in the passages. Here are a few pages that I have worked on in the book. The pictures in the book are exact replicas of the slides used in the online lessons. I like that there is plenty of room on the pages to take notes. The book comes in physical form, as well as PDF. I loaded the PDF onto my phone. That way I can study even if I am not home. I honestly have seen no cons to these online classes. Everything has gone smoothly, the instructors have been awesome, and the web interface has worked very well for each class. The teacher emails regularly, and we are encouraged to email her with any questions, or problems. I have thoroughly enjoyed my time in these classes. I have learned a lot and look forward to taking more classes in the future. For more information about these online Hebrew classes, visit Israel Institute of Biblical Studies. Enter to win a free Biblical Hebrew Course! After you enter, you will receive an email for $100 off a class. Sounds good, right? 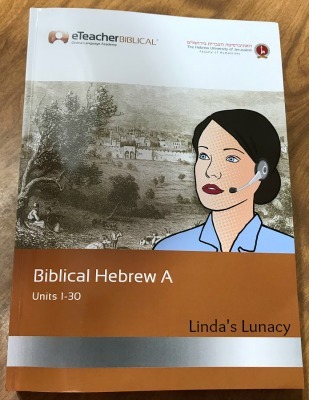 Click on over to enter the Biblical Hebrew Course Giveaway! As part of the Homeschool Review Crew, I have been using Biology 101 from The 101 Series with my 10th grade son. 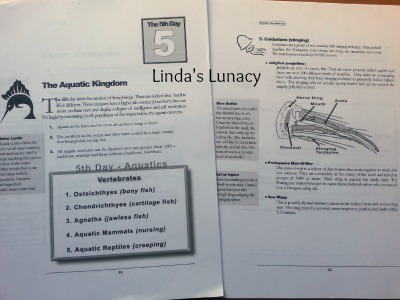 The 101 Series high school science curriculum was started after a homeschool mom couldn’t find what she was looking for from the biology curriculum available. Biology 101 is hosted by Wes Olson, Multnomah Bible College graduate, veteran filmmaker of 15 years, and homeschooling father. Not a homeschooler? You can still use Biology 101 if your children are in public or private school. These dvds will provide a clear Christian context for all of the information they have learned in their classes. 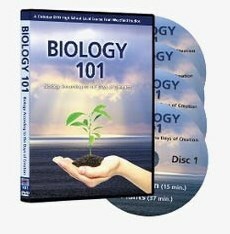 Biology 101 is a complete high school level overview of biology from a Biblical perspective. These 4 DVDs are full of accurate and fascinating information, with hundreds of captivating visuals and graphics. This high school science curriculum is easy to use, and easy to understand. Biology 101 divides all life according to the days of creation. There are 7 major divisions in Biology 101: The Introduction – Life Defined and Life Classified, The 3rd Day – plants, The 5th Day – Aquatic Creatures, The 5th Day – Avian Creatures, The 6th Day – Land Animals, The 6th Day – Mankind, and Genetics. These are divided into 11 segments, then divided into 27 individual weeks of study. If you do one segment every week, it will take you about 7 months to finish. This is easily customized to your own schedule. The nine individual segments range from 30-45 minutes each. Included on the fourth disc is a printable guidebook that puts all the information on the dvds into print, and adds additional information as well. 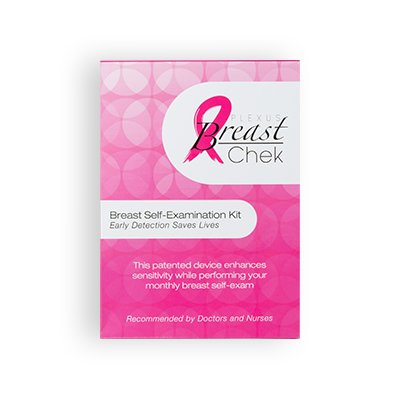 Each guidebook segment includes a multiple choice quiz and discussion questions. A 12-page Course Accreditation Program booklet is also included on the 4th dvd for those families that want a year-long biology course. This shows what should be completed when, with the suggested hours needed to complete. It has a place to record the actual hours that the student spent on each activity. The Accreditation Booklet averages 5 hours of work for every week. 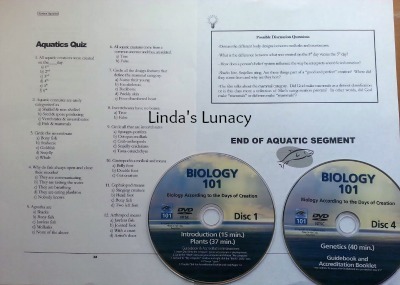 Using the DVDs and Guidebook, both printable, the activities include making a Biology 101 notebook to record all your work, research and lab reports, discussion questions, fun and easy labs. As well as taking field trips, suggested books to read, and using resources on the web and at your local library The Biology 101 labs and activities mostly use pretty common materials. None of the labs require the dissection of animals. Though one of the suggested field trips is to catch a fish and prepare it for eating. I have been using Biology 101 as a supplement to my sons current biology curriculum. He has been averaging one segment every week. I printed the Guidebook for my son to use. I am viewing the guidebook and the accreditation book on my computer as I need to. I like that everything on the dvds is in the guidebook. It makes it very easy for the students to review and study the material presented. The dvds are very well done. The material is presented in such a way that keeps it interesting for the students, as well as adults. I have watched most of the videos with my son. We both have liked the way the material is presented on the dvds. Replacement disks are available! So if life happens, and one of the dvds gets damaged, you can purchase just that disk and not have to purchase the whole set again. I wish more home school curriculum producers would offer that option! Another great thing about The 101 Series is that you can make as many copies of the guidebook and the quizzes that your family needs. The Accreditation book says you can make copies of the guidebook and the Accreditation program for your family, class, or co-op. Biology 101 is a full course high school course that can also be used to supplement your current biology curriculum. It’s also great for adults who want to brush up on biology before their kids get to it, or as an educational dvd for younger students, especially middle school science students. Also available in the 101 Series are Physics 101 and Chemistry 101. General Science 101 is expected to release the end of 2016 or in 2017. To see what other homeschoolers have to say about the 101 Series, click the graphic below. We love playing games as a family, so I was excited to receive Commissioned from Chara Games to review. 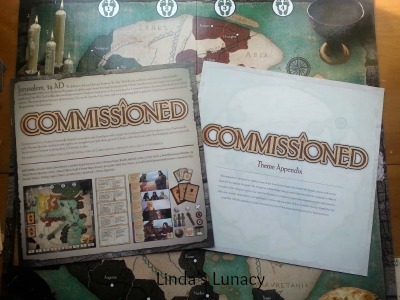 Commissioned is a historically accurate, Christian strategy board game. You don’t have to be a Christian to play and enjoy Commissioned, though! Commissioned presents the Biblical information, which is the first 150 years of church history, from a historical viewpoint. You do not need to know anything about Christianity or the history of the early church to play. We’ve been playing this board game as a family. Commissioned is for 2-6 players and recommended for ages 14 and up. I think the high minimum age is because it is a strategy game. If you have a younger teen that likes to play strategy games, I think they could play this game as well. Or an adult and a younger than 14 could play together as a team. That way the whole family could play together. There are a lot of little pieces, though, so younger than 3 shouldn’t play. Commissioned, which takes about an hour to play, is played in rounds on a two sided game board. 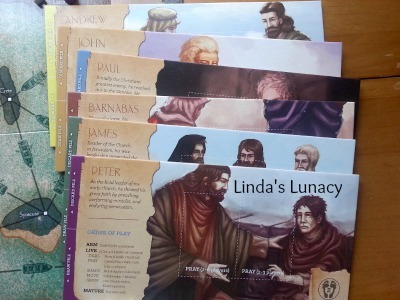 Players act as one of 6 Apostles of the early Christian Church, each with its own large playing board. There are 5 scenario cards to choose from. One of these is selected before the game begins. 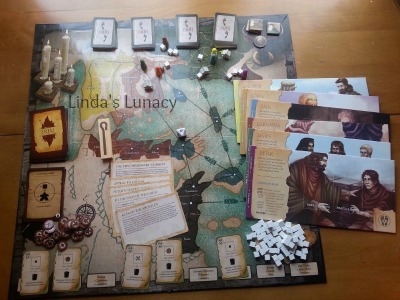 Each scenario is different, with different goals to be completed in each game. Because of this, the 2 sided game board, and the trial cards that are played during the game, no 2 games are the same. There is an over sized 12 page rule book with instructions and plenty of pictures that explains how to play the game. I like that a 12 page over sized Commissioned Theme Appendix is included with the game. It explains some of the historical background of the game, the people, places, and events depicted in the game. It has pictures of all of the Trial and Faith cards. It explains each of these cards with the history behind what is on the card. Some have Bible verses to help explain it. Commissioned is little complicated to learn. However, after watching the how to play video on the website, which is 24 minutes long, and playing a couple of times with the rule book in hand, we had learned how to play. Here’s a short overview video that explains a little of the church history behind the board game, and a little about the game play. Players take turns as the group’s elder, passing around a staff, and must make decisions affecting the team. Faith Cards are drawn & played, Trial Cards are chosen and completed, the books of the New Testament collected, church members added, new churches planted, and persecution overcome. Game play continues in rounds until the scenario card victory conditions are met, before the Trial Deck runs out. 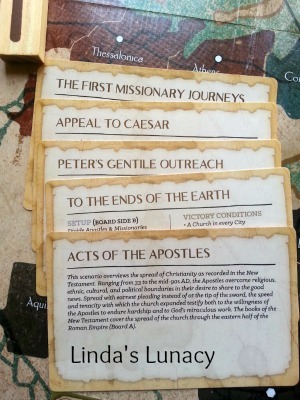 If the Trial cards run out before the conditions are met, or 5 churches are extinguished, the game is over. Commissioned is a collaborative game, everyone wins and loses as a team. 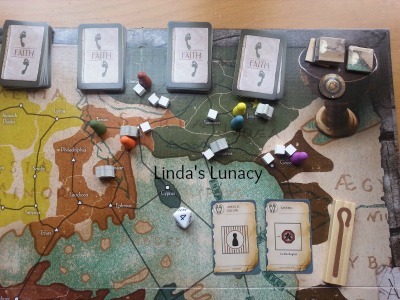 While learning to play the game, it seemed complicated and overwhelming. Once we learned all the rules, it wasn’t complicated at all. 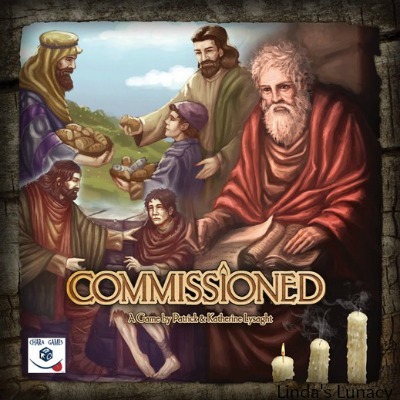 Commissioned is a great family strategy board game that I’m sure we will be playing many more times. To see what other homeschool families have to say about Commissioned, click the graphic below. Chara Games has a new game coming soon, 3 Seeds, that looks like a lot of fun. 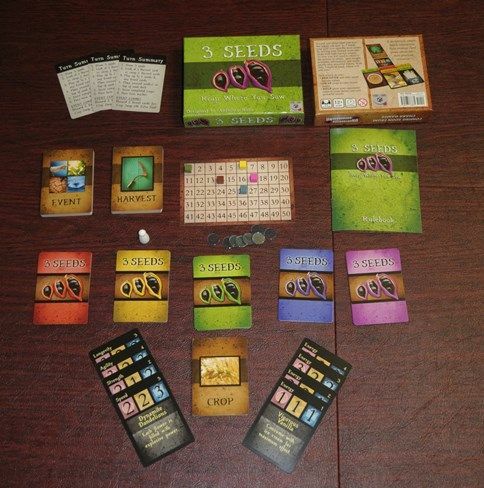 3 Seeds is a light strategic card game. I will be receiving it soon to play with my family. Be sure to keep an eye out of that review! 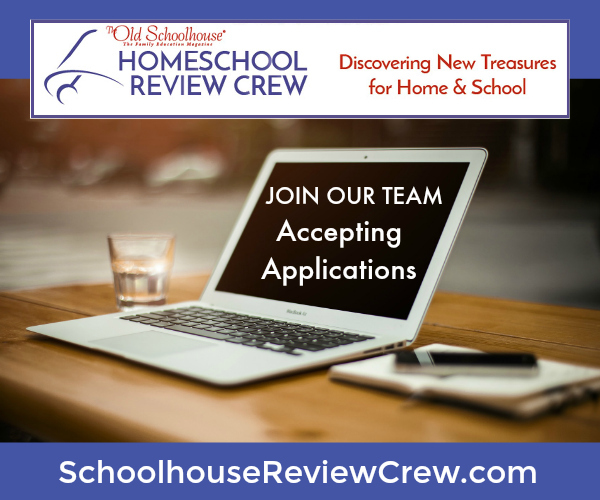 Apply Today to Join the Homeschool Review Crew! I have been part of the Homeschool Review Crew since 2011. It has been great for our homeschool! We have been able to use and review some great homeschool curriculum and other products with our family. If you are a homeschooler that blogs, check out this info to apply for the 2017 Homeschool Review Crew! *Disclosure: This is not a sponsored post, and those aren’t affiliate links. I’m just sharing information that might be of interest to others. 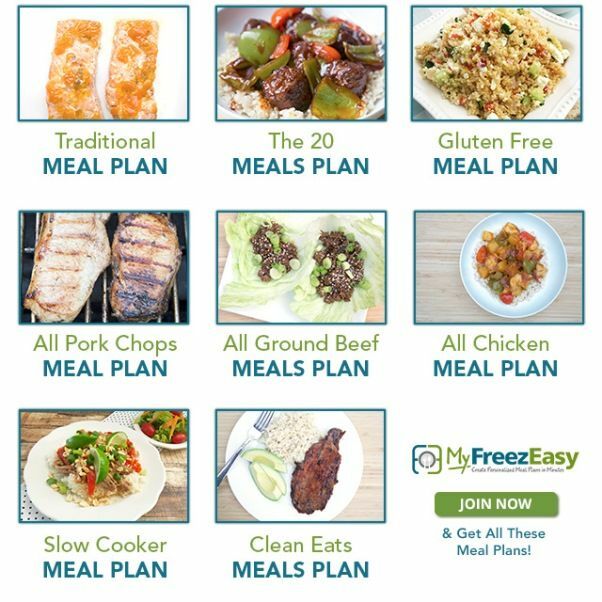 For the past few weeks I’ve been trying out some great freezer cooking recipes using the MyFreezEasy.com Freezer Meal Plan Membership from MyFreezEasy. I have been freezer cooking on and off for several years. Freezer meal prep can be challenging. With the MyFreezEasy freezer cooking plan, everything is already planned for you! I have been using the Premium Annual Membership of MyFreezEasy for this review. It is so easy to use. MyFreezEasy is perfect for beginners. There are many different options available. You can buy individual meal plans, a months worth of meal plans, or the Premium Annual Membership like I received and have access to everything on the website. I love that the recipes have directions for eating that day, freezing directions, and how to thaw and cook when you pull it out of the freezer. 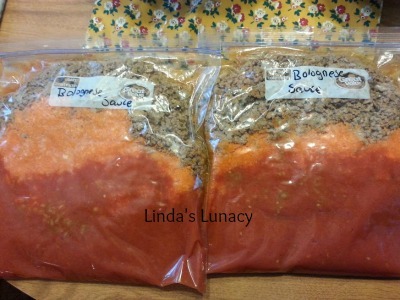 For this review I put everything that I made into the freezer so I could test them. It was really hard to put some of them the freezer! They all look and smelled amazing. I tasted the ones that didn’t have raw meat in them, and they were all great! Every month, 8 new meal plans are released. These meal plans contain all the information you need to make the meals in each plan. The recipes, shopping lists, prep lists, and more. Here are the 8 plans available each month. Each plan has 5 recipes. The plans have directions for making 2 of each recipe, or directions for just making one of each. There are also directions for serving the recipe when you are making it, and how to freeze, thaw, and cook for another day. All 8 of these plans are available each month with new recipes in each plan. These plans are not archived on the website. If you want to save these plans, you need to save the PDFs to your computer. The recipes, however, are permanently added to the website database. If you forget to save a plan that you liked, you can make your own plan. Keep reading to see how! The plans included the recipes, of course, lol, assembly instructions for making all the meals at the same time, and shopping lists. 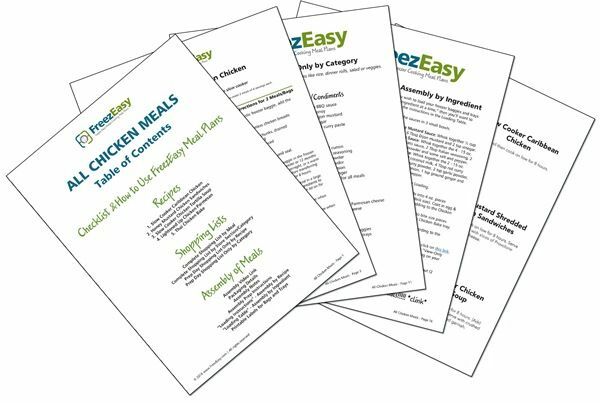 There are 4 shopping lists in each meal plan, a Complete Shopping List by Recipe, a Complete Shopping List by Store Section/Category, a Freezer Meal Prep Day Shopping List by Recipe, and a Freezer Meal Prep Day Shopping List by Store Section/Category. So you can choose which list works best for the way you shop. You can also print labels for the recipes in each plan that have the cooking directions on it. No need to look up the directions at the time of cooking if you use these labels. Now not every plan is going to work for everyone. Families may not like all the recipes in a plan. You may have a larger, or small, family than the 4 serving recipes in each plan. Not a problem. You can use the Build Your Own Meal Plan feature on the website. The database is chocked full of recipes. You can just scroll through until you find some recipes you want to try, or you can choose one of the 19 categories first to make finding recipes easier. You can search by type of protein, cooking method, gluten free recipes, dairy free recipes, gluten free dairy free soy free recipes, and many more. It’s very easy to build your own meal plan. You find the recipe you want to make, choose how many servings you want, 2,4,6, or 8. You then drag & drop the recipe into the box on the side of the page. The directions on the page are clear on how to do this. After you have added all the recipes you want to make at this time, you can print out your plan. It will be customized to the number of servings you selected. The website automatically updates each recipe and the shopping lists for the number of servings you selected. There is no limit on the number of plans you can you can build. You can print everything, or save the PDFs to your computer. 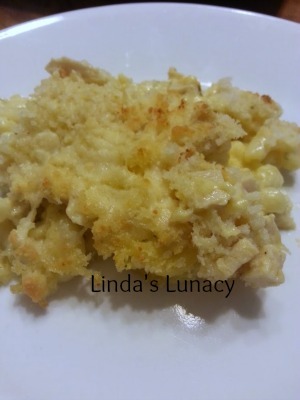 Here are some of the recipes I tried. 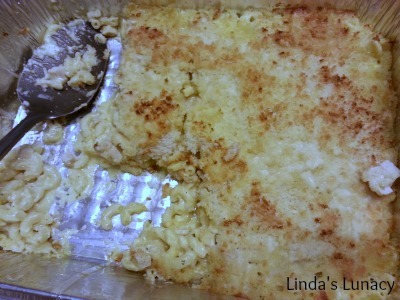 Chicken & Ranch Macaroni has a delicious ranch cheese sauce that is very easy to make. The recipe uses rotiserri chicken, but I used cooked, diced chicken breast. This was amazing! The whole family loved it! I have one more in the freezer and we are all looking forward to eating it! 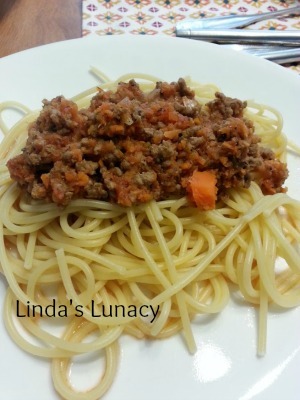 The Bolognese Sauce was very easy to make. You cook the meat and prep the veggies. I used the food processor to do the veggies. Then I just had to add all the ingredients to the freezer bags. 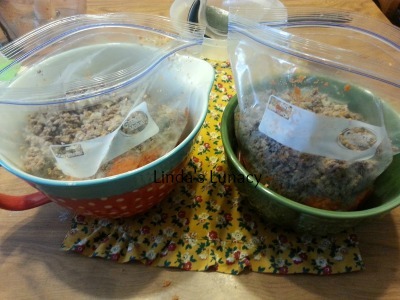 I stood the bags up in bowls as it makes it easier to fill the bags. They won’t tip over while you are filling them and spill the contents everywhere. 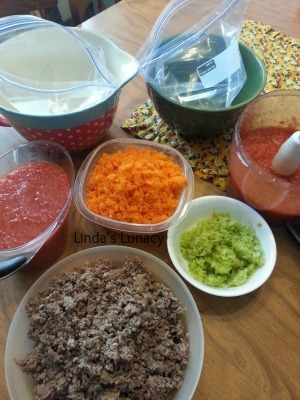 All ready for the freezer…..
As soon as I saw the recipe for Bacon Cheeseburger Nachos I knew that my family would love them. They were very easy to prepare. 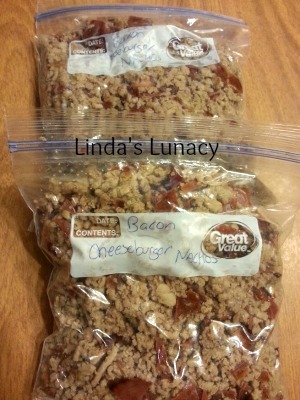 Cook the hamburger with some seasonings, cook the bacon, cool, and put into freezer bags. Thaw when you are ready to serve. 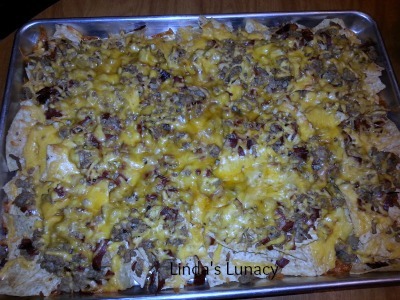 Then place tortilla chips on a baking sheet, top with the bacon hamburger mixture, then cheddar cheese. I will use more cheese next time as I don’t think I used enough. I didn’t measure the cheese (my bad) so I don’t think I used the right amount. Thankfully, I have another bag of this in the freezer still, because we all loved it. The meal plan uses it as a meal but I served it as an evening snack on a day that we didn’t have a big dinner. I had never had Butter Chicken before, but it sounded good, so I tried it. It’s very easy to assemble. 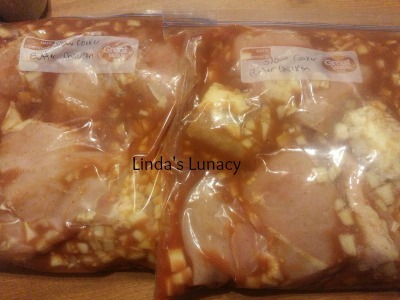 The raw chicken and other ingredients go in a freezer bag and into the freezer. The day you want to have it, you dump it all in the slow cooker. So easy! 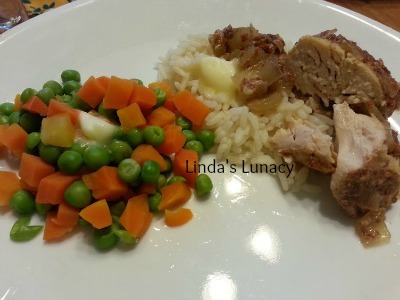 I served the Butter Chicken with rice, and peas & carrots. It’s very flavorful, and very good. Hopefully, you aren’t tired of looking at food yet, as I have one more great dish to share with you. 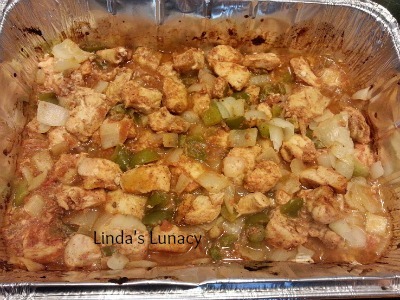 Chicken Fajita Bake. Again, assembly is very easy. It really couldn’t get any easier. 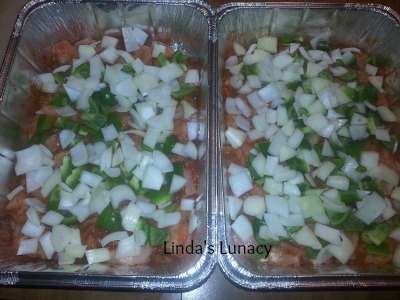 Put the meat, seasonings, green peppers and onions in a foil pan. Cover, and freeze. Thaw and bake according to the recipe directions. So good! I served this with rice, and a side veggie. This would taste great served on tortillas, also. I’m going to try that next time. We’ve eaten both pans of this that I put in the freezer. I will be making more, as it’s very good. That’s just a taste of some of the great recipes available with the MyFreezEasy.com Freezer Meal Plan Membership from MyFreezEasy. And how easy it is to follow their recipes and plans. 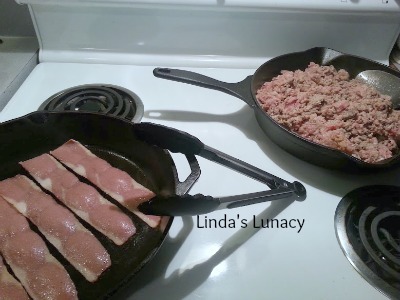 MyFreezEasy is a great tool to make your life in the kitchen so much easier. All the recipes that I tried were great. 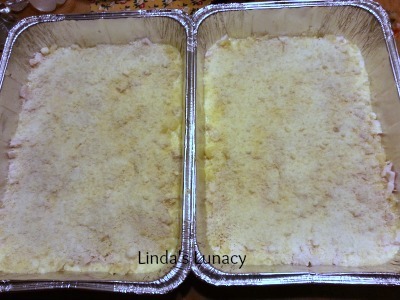 All the plan and recipe directions were well written and easy to follow. 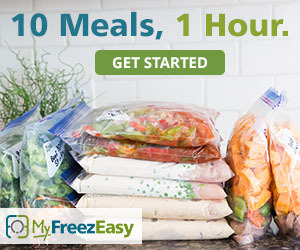 Whether you are new to freezer cooking, or have been doing it for a long time, MyFreezEasy will be a great help to you. Freezer cooking has never been easier! To see what other homeschool moms have to say about MyFreezEasy, click the graphic below. I love to review homeschool curriculum. The books I’m going to tell you about now aren’t just for homeschoolers! They are for all students, no matter where they go to school. 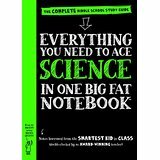 The Big Fat Notebook series of books are study guides for middle school students that focuses on the five core subjects. 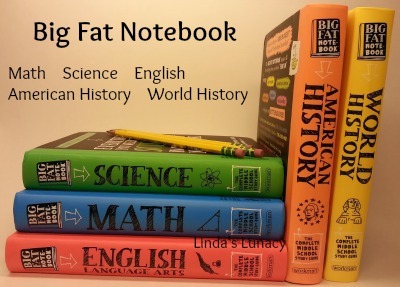 The Big Fat Notebook series makes studying cool. 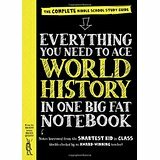 These books deliver everything a student needs to know to ace Math, Science, English Language Arts, World History, and American History. 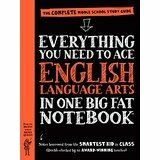 The pages of the Big Fat Notebook are colorful and easy to read. Here are a few sample pages. After reading a section, there are questions for the student to answer. The answers are on the next page, not visible when doing the questions, making it easy for the student to check their answers. 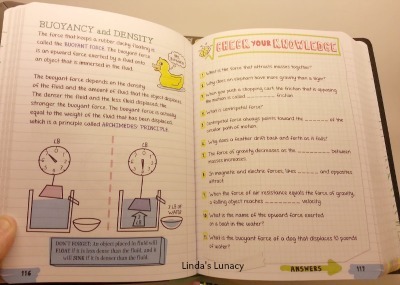 The drawings in the Big Fat Notebooks not only illustrate the lesson, but are fun to look at. I like that the books give examples while covering the material. I think that makes it easier for the student to remember the material. 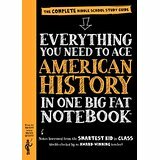 The Big Fat Notebooks retail for $14.95 each. I think that is a great price for the size and quality of the books. The books are available on Amazon, the pictures below are linked. Simply click on the pictures for more information about a book, or to purchase. 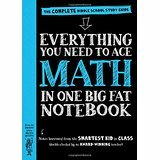 The Big Fat Notebook series of books are for middle school students. In my opinion, these books could also be used in upper elementary school, either read by the student or read aloud to the student. I also can see value in using these books with a high school student that needs a refresher, or needs remedial work. So don’t rule these books out if your kids aren’t in middle school. 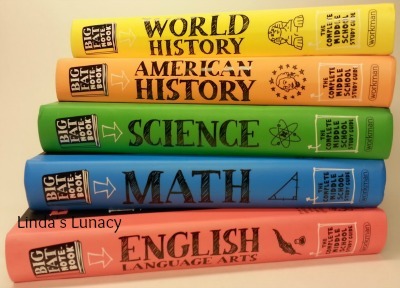 Enter to win a complete 5 book set of Big Fat Notebook! Simply fill out the Rafflecopter form below to enter to win all 5 of the Big Fat Notebook books shown here. Be sure to read the terms & conditions on the form! Disclosure (in accordance with the FTC’s 16 CFR, Part 255: “Guides Concerning the Use of Endorsements and Testimonials in Advertising”): I received one or more of the products or services mentioned above for free in the hope that I would mention it on my blog. Regardless, I only recommend products or services I use personally and believe will be good for my readers. I am disclosing this in accordance with the Federal Trade Commission’s 16 CFR, Part 255: “Guides Concerning the Use of Endorsements and Testimonials in Advertising.” My opinions are my own. *This post contains affiliate links. If you click the link & make a purchase, I will receive a small commission. 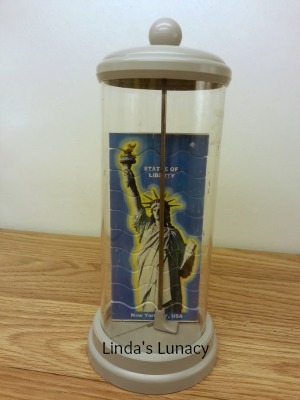 My family loves puzzles and games so I was happy for the chance to try the Statue of Liberty FlipStir Puzzle from Enlivenze LLC. 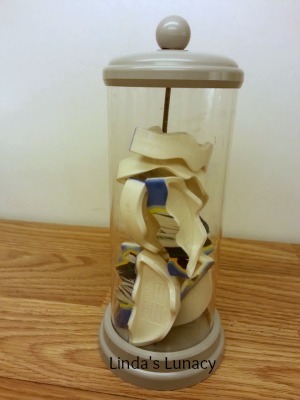 FlipStir is a self contained 3 dimensional puzzle that you put together inside the container. There are currently 5 different FlipStir puzzles. Three are Level 2 puzzles, like the Statue of Liberty FlipStir I tried. There are two Level 1 puzzles to choose from. Level 1 puzzles have smooth edges, while Level 2 puzzles have wavy edges making them harder to solve. All the puzzles sell for $24.95 on the website. FlipStir puzzles are recommended for ages 7 and up. There are no loose parts. The only moving part is the wand that you use to move the puzzle pieces around with. The wand is not removable from the puzzle. The FlipStir can be left sitting out with no worries of little ones getting into the pieces. I have been leaving ours in the living room. It’s a great conversation starter with guests. Then they give it a try. And like it! Trying to solve the puzzle is easy. Shake – Stir – Solve. You use the wand, gravity, and whatever you can think of to line the pieces up. It can get a little interesting watching someone trying to solve the puzzle. They (I guess I should say we!) shake, move side to side, and practically turn upside down, trying to get pieces to slide into place. And then there is the satisfaction of solving the puzzle! FlipStir Puzzles are great for kids and homeschools. 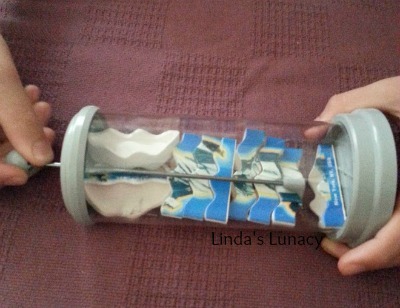 While solving the puzzle, using the wand helps improve fine motor skills and dexterity. Working on these puzzles also helps improve hand-eye coordination and spatial relations skills. I think adults with health challenges would receive these same benefits, too. These puzzles aren’t just for kids! I have been having great fun with it. 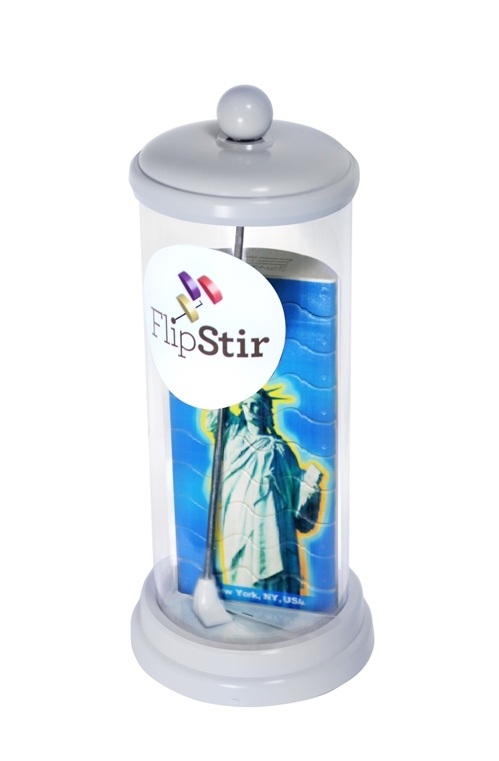 I have solved the Statute of Liberty FlipStir puzzle several times. My whole family, from teenagers to adults have been having fun with it. FlipStir self contained puzzles are so much fun! And no puzzle pieces to pick up off the floor! FlipStir puzzles are great on the go, too. In the car for short or long trips, while visiting, or any time you want to keep the kids occupied. We took a lot of car trips when I was a kid. I would have loved having these puzzles! You can connect with Enlivenze LLC and FlipStir on Facebook and Twitter. To see what other homeschool families have to say about this and other FlipStir Puzzles, click the link below.